Groundwater in the Coastal Plain, East of I-95, is under stress. During the last 18 months, Virginia water officials have been negotiating cuts to groundwater withdrawals by the state's biggest users. Now, they are looking at another large user. From paper mills to cities, the Department of Environmental Quality has been quietly working with the Commonwealth's 14 largest permitted groundwater users. Scott Kudlas oversees the state's water supplies. He says they withdraw anywhere from 2 to 36 million gallons a day. The largest user, WestRock paper mill in West Point, pulls about 22 million gallons of water a day. Over the next ten years the company has agreed to cut back to about 17 million gallons a day. So far 13 of the 14 largest users have agreed to gradual cutbacks that will nearly halve their collective total daily withdrawals. 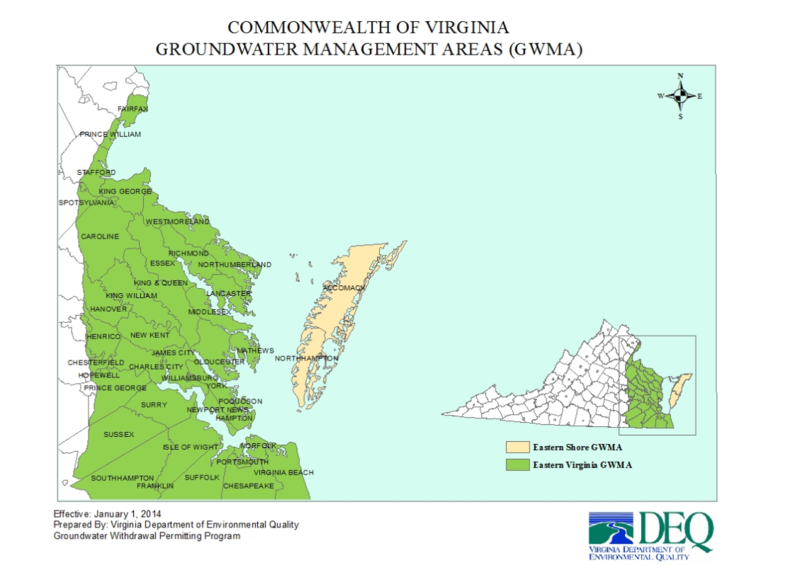 Groundwater management areas along Virginia's coast. And there's another big user that's not permitted and is estimated to be taking nearly 40 million gallons a day. So, who is it? DEQ asked a wide range of stakeholders – including home builders, paper mills and environmentalists – for help in how the state might protect the aquifer for future growth and development. This week, The Eastern Virginia Groundwater Management Advisory Committee made 12 recommendations. Those ranged from ensuring funding for groundwater monitoring, considering banking and trading credits for water usage to injecting treated wastewater into aquifers like the Hampton Roads Sanitation District’s SWIFT (Sustainable Water Initiative for Tomorrow) pilot project. Finalized recommendations will go to the General Assembly in November.